Purchases included some Uncharted Seas stuff; another Elven Dragon and a Flagship. Still in two minds about if the flagship is a nice fit, either visually or rules-wise, with the rest of the fleet. Also managed to pick up the latest three issues of Battlegames, the 'old school' wargames magazine. You can tell they are 'old school' as they spell 'old skool' properly. 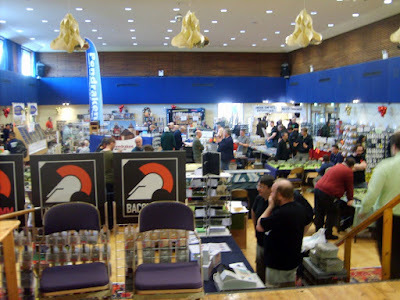 Did managed to resist buying any of the reprints of the Featherstone or Grant books, can remember reading them twenty years ago when Barrow Library actually had a wargames section. (All five books of it.) The Library itself probably holds less than half the volume of books it once did. Was wanting to check up on the new Perrys 'Wars of the Roses' 28mm plastics, but it looks like they've not out till next week or maybe sold out on pre-orders as couldn't see any around. Would of been my first foray into plastics since a child, but have never painted any. Was thinking of getting them to use in a quick play game for resolving battles in the Kingmaker boardgame. Did manage to do some prep work and snagged a WotR Osprey book on the cheap (but not the newer one which is just a potted history with no pictures). 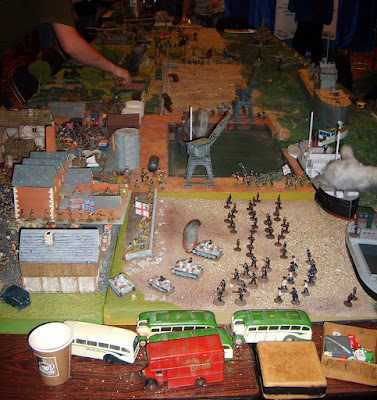 Biggest game in the show was probably the 'Very British Civil War' game. Apparently fighting over Hull, or maybe fighting to get out? Upstairs there was a horde of Teddy Bear games using all the lines of Eureka Miniatures range. It includes one game set in a which included fake scalextric track in a fake toy room setting. 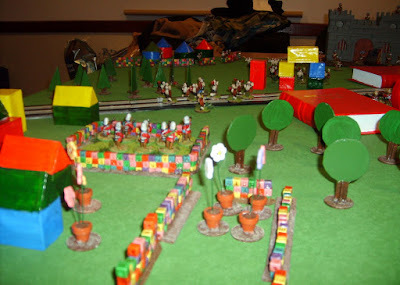 It had to be fake as what sort of grown up would play with toy soldiers? What the neighbouring Lance and Longbow people thought of this is unrecorded. Weather was looking a bit grim on leaving the hall so returned via the Motorways. Ended the day by visiting Jabberwocky and picking up an Xmas gift I pre-ordered.